This braille restricted access prohibition sign helps ensure people with visual impairment are informed of locations which are restricted to members of the public, ensuring the safety of all. The raised letters, prohibition symbol and braille ensures this prohibition braille/tactile sign can be read by everyone. Designed to help you meet your obligations under the DDA and Equality Act 2010. Our braille signs have an adhesive backing for easy installation. 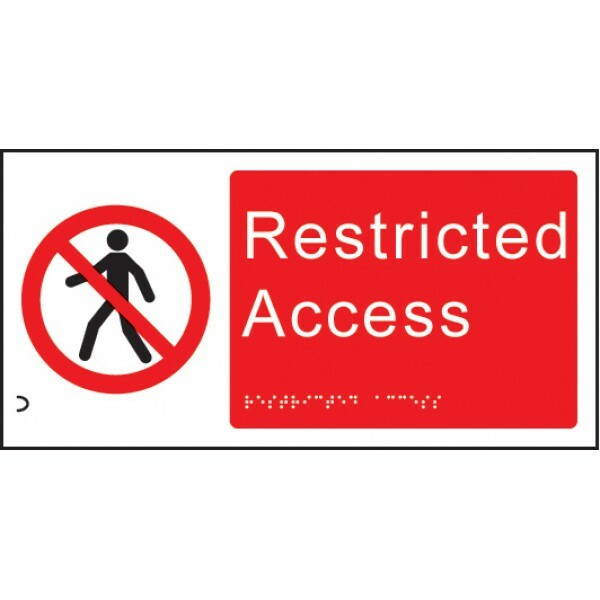 These site saver signs are manufactured from a low-cost material, allowing us to provide you with your own branded prohibition signs at an affordable price. Simply send us a Ai, EPS or High Res JPEG o..
9mm thick rigid white gloss PVC Lightweight with high impact strength Easily drilled Suitable for both internal or external useHandy A4 size sign. Material Options Explained Below is a more detailed ..
Indicate areas with restricted access and prevent unwanted access to specific areas Material Options Explained Below is a more detailed description of the materials this particular safety sign is ava..